If you are the Halloween party hosts this year, don’t fret. 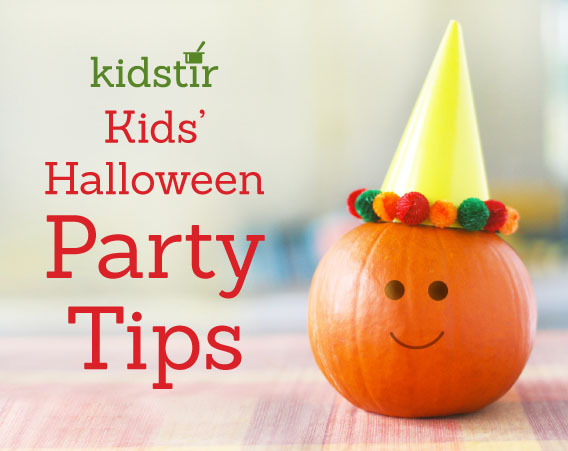 We have some simple ideas that will help you pull off a pre-trick or treat bash without turning into a monster. Keep the party games fairly simple—and play outside. Line kids up for a mini pumpkin on a spoon race or bury small toys for a find the favor in the haystack game. A simple costume parade around the yard also makes a great photo opp. Check out our collection of fun kids cooking games! Kids will fill up on candy when they trick or treat, so start with some ghoulish but also good for you foods. Serve up Spaghetti and Eyeballs or the Scary-oli from the Kidstir Halloween kit. You can also set out a buffet of healthy finger foods—carrot coins, sunflower seeds, cheese cubes, and dried fruits and nuts. Give the snacks fun names with our Tabletop Tags. Once the guests arrive, let the spooky fun begin. Take time to listen to the kids talk about their costumes. Then play a few games, enjoy the creepy cuisine, and take some photos. Send the kids off on their trick or treating adventure.